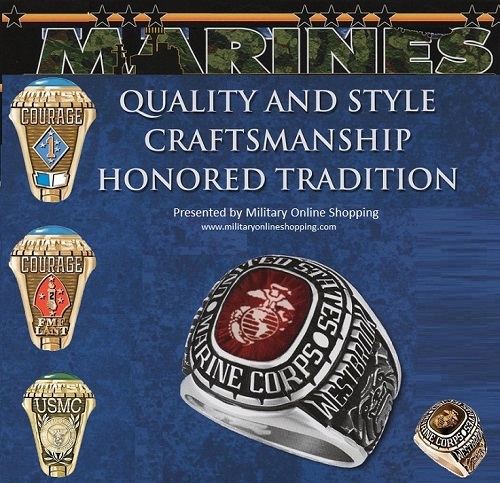 Marine Corps Rings serve to remind people of a Marine’s service in the United States Marine Corps. Rings are custom made for all units and divisions to record battle details. From 1990 to the present Marines have participated in every operation in the Persian Gulf, including Desert Storm, Iraq Freedom, and Enduring Freedom. The Marines would be responsible for securing many of the cities in Iraq and Afghanistan. If you have a loved one serving in the Marines and wish to buy them something memorable, then consider a custom made ring. Rings are a fantastic visual reminder of your loved one’s service and dedication. Marine emblems can be highlighted on the either side of the ring. You can also have the insignia placed under the stone. These rings can be engraved with a message inside the band. Ordering online is easy and you can have the ring shipped almost anywhere in the world. You are one of the few, the proud and part of a distinctive league of marines. Display your fidelity to the Corps with gallant grace by wearing custom designed rings, tailored to reflect your own unique marine corps experience. When you’re not in uniform, custom Gold Marine Corps rings display your commitment to honor and courage. Everyone who sees your custom rings recognizes the sacrifice and level of commitment you have devoted to your country. Custom Marine Corps Rings are not just for others to see. They serve to remind the wearer of what’s been given and gained throughout the years of service. Opulent rings mirror your rich and rewarding career in the Corps. They serve as reminders of the bonds of trust shared with fellow Marines and stir up memories both solemn and triumphant. As you can appreciate these rings are custom made using the details you provide at the design stage in the shop. The company we use to create these rings process approximately 500 rings per week for the various military branches. We ask you to please allow 4-5 weeks for delivery. So order now today and avoid any delays !